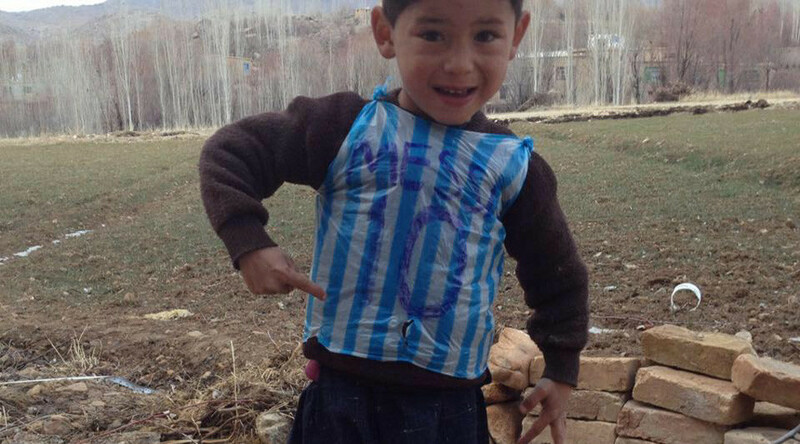 The young boy wearing a homemade jersey of Argentinian football star Lionel Messi in a photo that went viral has been found in Afghanistan. Internet sleuths tried to figure out the boy's identity after the photo was shared on thousands of social media accounts. While many thought it was an Iraqi child, the mystery has finally been solved and it turns out the boy in question is five-year-old Murtaza Ahmadi from the Jaghori District of Afghanistan’s Ghanzi Province, according to the BBC, who contacted the boy’s father, Arif Ahmadi. Described as Messi’s “biggest fan”, Murtaza’s makeshift kit was made by his older brother, Homayoon, as their family could not afford a genuine Barcelona or Argentina jersey. The young football fan could yet meet his idol after a popular Messi fan account on Twitter said they had been contacted by Messi’s representatives who want to “arrange something for him”. While the Ahmadi family can't afford football gear, the children might be able to get a job making it. Children as young as five years old have been found in factories making footballs and gear in nearby Pakistan and India, according to advocacy group Global March Against Child Labour.